A double top failed, now I anticipate a possible Higher High following Box BO North. Point 3 Failure @ 91.51 Solid breakdown and close below box could mean further shorts Alternatively, break up and acceptance beyond the Critical Major Lower High could launch the uptrend. Republishing this idea cos it got blocked by moderators 3months beck. I broke house rules then ;) I'll do a 4H chart for a potential buy trade in a jiffy. A successful breakdown would see this deadlock trending down finally. That said, I'd love to short signs of higher prices rejection, or buy break and acceptance above box high. CRUDE OIL__daily:--- ABC & Box Method. EURUSD__Daily: Box Method--. BO&C > 1.1846 = Buy Continuation Lovely trend action on the daily graph! 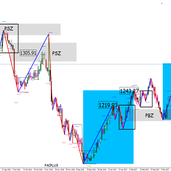 GBPJPY_weekly Buy Thesis = Explosive Trend Starter Would look for entry on lower timeframes. Follow to avoid missing out on the next Pound yen flight. You better not go below my box!